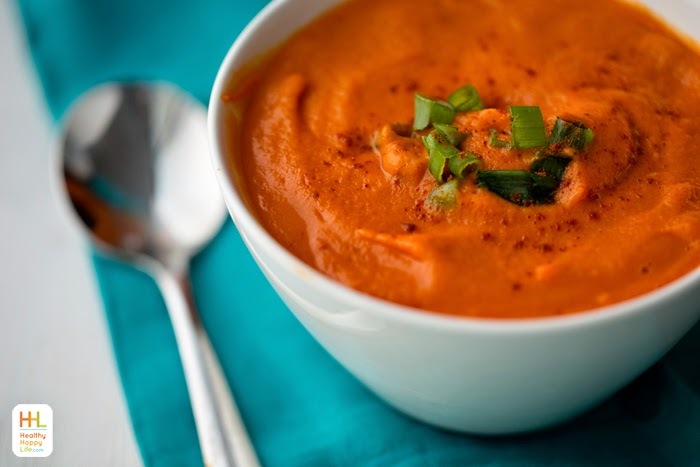 Creamy Carrot Ginger Pumpkin Soup. Easy! Chop-Boil-Blend. THIS soup guys. Lets talk about it. But first, can we talk about these crazy short days and lack of sunlight? And the craziness of this month? Anyone else feeling it? This month has been insane. I can't even explain it right now because I am furiously typing, barely even aware of the words that are spewing onto my screen. But I always have time for delicious soup, and with this recipe, you can too. If you feel a bit too speedy this time of year, join me and slow down by diving into a bowl of steamy comforting soup, soup that you made!.. Dear November, slow down. Stop and smell the cranberries. Do cranberries smell? Like, cranberries on the bush? Hm. Deep thoughts I know. Speaking of holiday things, this is for you: my Thanksgiving recipes blogpost - grab some inspiration for your feast. Loads of recipes and vegan-inspiration. 1. 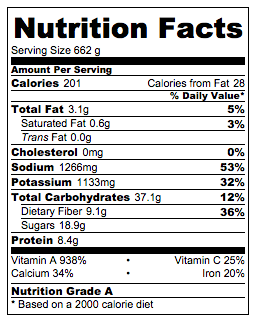 Nutrition. When I am busy and running at full speed I NEED nutrient dense foods on my plate or in my bowl. Or smoothie glass. 2. Speed. Think Iron Chef gone vegan. Things need to happen quickly. 4. Coziness! It has to have a homestyle feel! It has to taste like I made it. Like it was made with, oh gosh how clichè, but made with LOVE. Oozy, swoony, warm fuzzies, kittens playing, babies giggling type of LOVE. A must. This soup satisfies all those qualities. So do these.. So onto this soup. It rocks. I mean the color alone.. 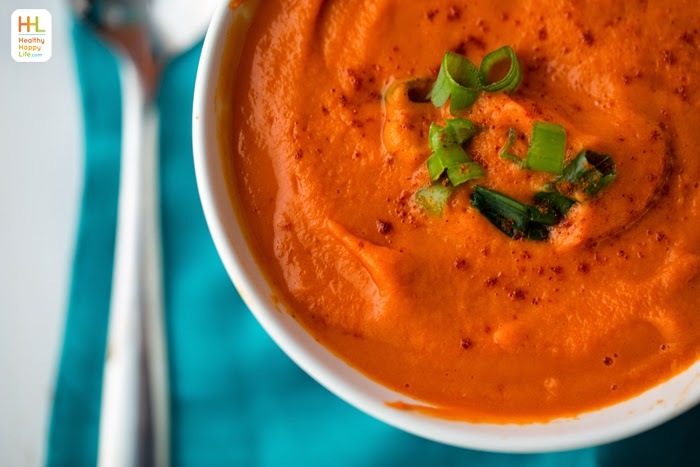 Carrot ginger soup is a favorite of many. It is commonly found as a "soup of the day" on restaurant menus, with its crowd approved sassy-sweet flavor. 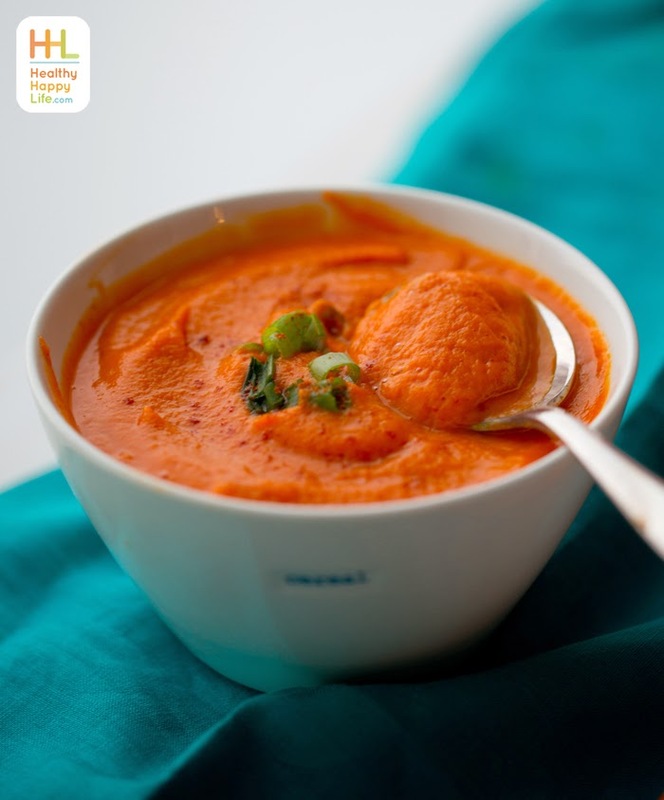 The spicy warming ginger mingles perfectly with the creamy, golden, sweet carrot. 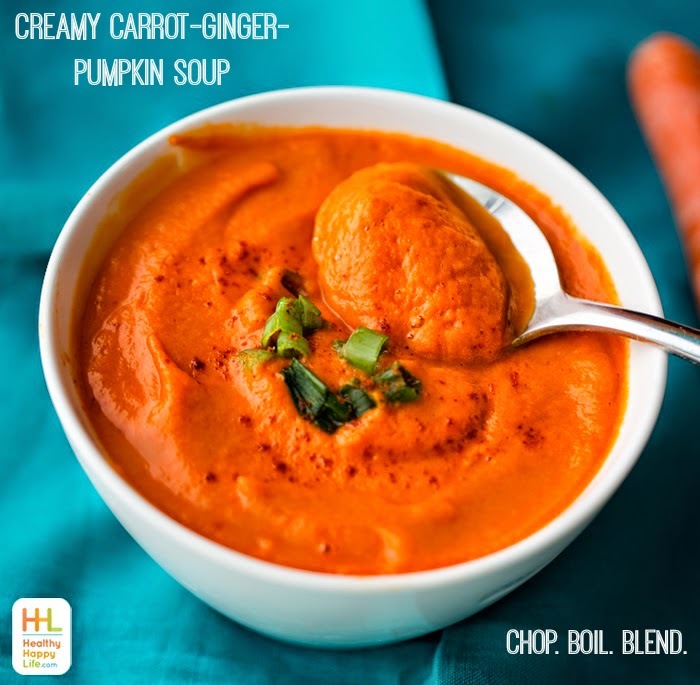 Well today's Creamy Carrot Ginger Pumpkin Soup is extra special because of that rich and creamy pumpkin texture that accents. 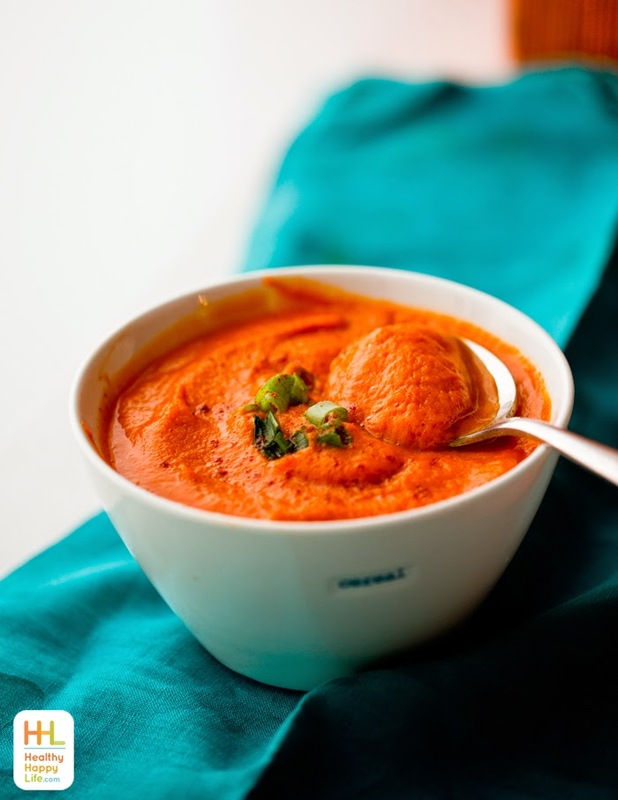 Easy Blender Soup. I use a simple chop-boil-blend procedure that happens in a flash. Get creative with spices or use the ginger-turmeric-cinnamon spice blend I used. Garnish with something green like chopped onions to make the color pop. Grab a spoon and cozy up to a bowl with me! Pair it with my 5-step kale salad for a yummy sou-n-salad feast! cozy mood soup. 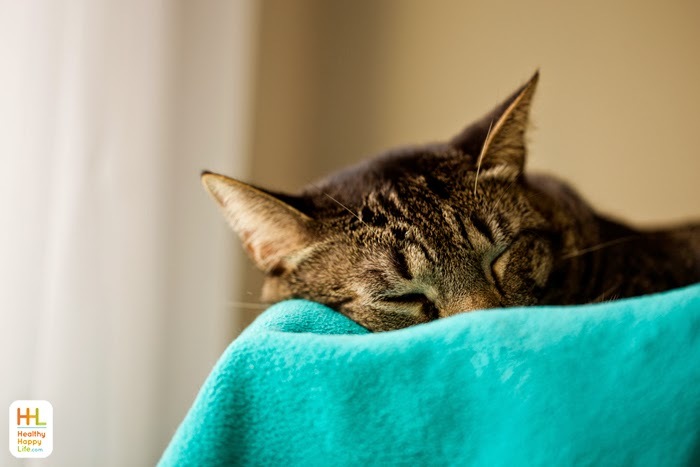 cozy mood kitty. This recipe is so easy, I Instagram video-ed it..
Boil-n-blend Carrot-Potato chipotle-garlic-ginger soup. Easy peasy dinner. This recipe makes two servings, around 200 calories per bowl. This super easy soup uses my chop-n-boil-n-blend procedure. Creamy carrot pumpkin and spice flavor. Roughly chop your carrots while you bring a large pot of water to a boil. Add carrots to the boiling water and boil about five minutes, or until the carrots are tender enough to easily pierce with a fork. Drain water and add boiled carrots to a high speed blender like a Vitamix. Then add the pumpkin puree, veggie broth, optional maple syrup and non-dairy milk. Blend from low to high until creamy. Adjust liquid to desired consistency - add more broth for a thinner soup. Add in the spices, garlic and ginger, and blend again until smooth. Taste test and adjust spices as desired. I like to add smoky paprika and curry powder sometimes too. 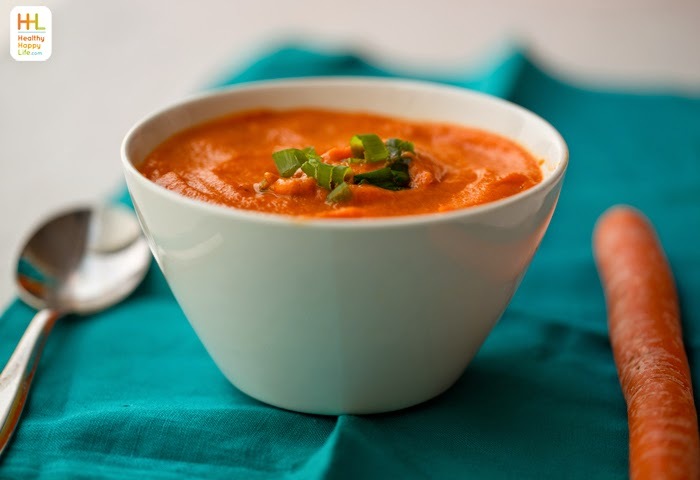 To heat the soup, you can use the "soup" setting on your high speed blender or pour the blended soup into a soup pot and bring soup to a low boil, then reduce heat and simmer until ready to serve. Serve warm, chopped green onion or something green on top as garnish makes the soup look visually stunning. Enjoy! Tip! Serve with toasted bread or a toasted roll slathered in vegan mayo. Perfection. 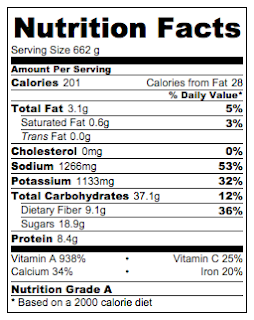 per serving (2 servings per recipe)..